Corbin stared at the small talisman in front him, contemplating what he would do once he owned his first major artifact. Having worked for the Order of the Crow for as long as he could remember after his parents died in accident, this was the first time he had been trusted with such an important task. And it would be the last time as well. Pulling it down from its pedestal, he hung it around his neck before he bolted for the secret cave's exit, sweat dripping from his face as he meticulously avoided the deathtraps set by the jungle savages out of fear for what they had worshiped as an idol. "Thief! Thief!" Corbin looked to his left and right as he ran and could see that the savages had caught on, and were now on the verge of killing him. "Great, now I have to deal with them." Pulling his sword from his back, he sliced two of them in half as they tried to flank him. Two more swung down in front of him from the tree branches above, and they met a similar end. "Kill him! Kill the god stealer-" A sword through the face can shut anyone up quickly. So far Corbin had kept a steady pace of running away and killing his pursuers, but he didn't know how long he could keep it up. "Use... me..." Corbin heard a whisper rise up from below him like a puff of smoke, and looked down for a second to see that the eyes of the talisman were glowing, and it sent shivers down his spine. "No! I'm doing fine!" One of the savages had gotten close enough without him noticing, and with a loud huff, a dart came flying out of its barrel, skimming his ankle. 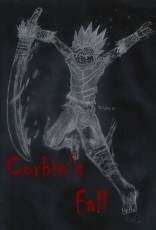 Corbin stumbled, but didn't fall, and did his best to keep the same speed even though it was now much more difficult. "If you used me, this whole thing would be over." He vaulted a large log, swing his sword as a savage jumped close behind, splattering his blood across the ground like paint on a canvas. "Just say my name, and you'll have all the power you need. You could even have enough to get back at the Order for using you as a tool your whole life. Just give in." Corbin got hit by another dart as it penetrated the back of his knee and going straight through his kneecap. "Agh! No!" "Just say it. I can even heal your knee." "Oltethub!" A red glaze covered Corbin's eyes and his sharpened to a point. Corbin was no more, and all that remained in his body was Oltethub. Black lightning covered his body, spreading out as it struck into the hearts of the savages and set fire to the trees. Soon the Order, and then the Kingdom of the Crow would know learn vengeance from the body of the boy they treated as an object and a talisman they had once thought was to be used as just another tool. © Copyright 2019 Zach Reynoldson. All rights reserved.